I am fascinated with a few things to the point that I obsess about them. Well, it may be more than a few things. One of them is words. I become amazed with the beauty a word may have. With the way it sounds. With the way that pronouncing that word may change the way I breathe or make me pout my mouth. With how much power a word can hold. With the diverse meanings it can contain, depending on who you say it to, how you say it, or by which words it is accompanied by. I absolutely adore words. I once started a “favorite words list” and just couldn’t keep up with how many I was adding. There were the words I had forgotten and had suddenly rediscovered. There were the words I had never ever heard of. I have a tendency to stop someone in the middle of a sentence to ask them about that word they just used. Where is it from, what exactly does it mean, how else can one use it? Always on the hunt for new words, when I find a great one, I fall in love with it. And once I do, I never fall out of love with it. This may all have to do with my being a Spanish speaker until I moved to the US. Once here, I started noticing the beauty of words I was getting nostalgic about because I couldn’t find a good substitute in English. And once I started getting a bit more fluent in English, I would find the use of a certain English word so extraordinary that I couldn’t find the right substitute in Spanish. So I sort of blame it all on my move to the US because I certainly wasn’t obsessed with words when I lived in Mexico. Anyway. This recipe has two words I adore in Spanish: pan and arena. Pan translates to bread and arena to sand. The funny thing is sometimes words and names play tricks on reality. This pan de arena is no bread and has no sandy texture. More like a pound cake, pan de arena’s texture is really perfect. 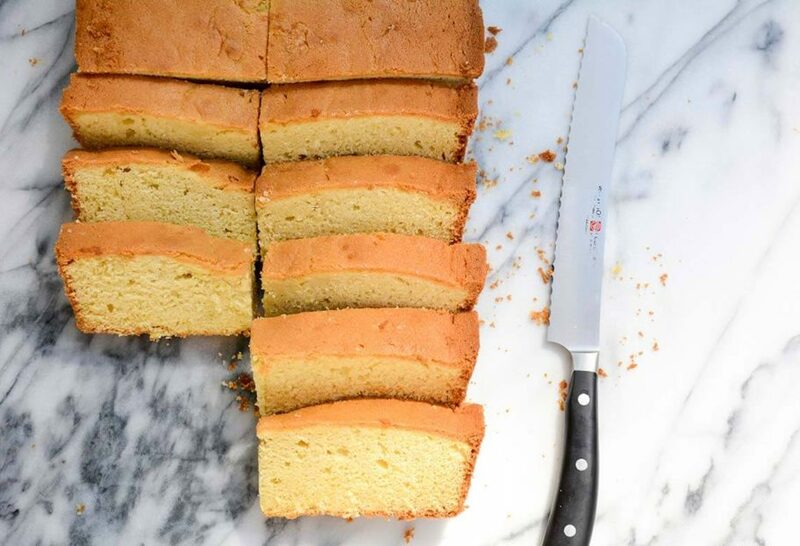 When you slice it, it feels like it came from a professional bakery. With just the right amount of moist and just the right amount of crumbly. It may be that because the texture is so evenly moist and crumbly throughout, it got named after sand. Its taste is also so well balanced. Just enough sweetness and a buttery taste that gets nuanced, but not over powered, by lime zest and lime juice. Yet it doesn’t taste citrusy at all. This pan de arena comes from the state of Chiapas in Mexico. You can find it there from morning ‘til night. Sometimes it comes in individual sizes – that may be why it is also called bizcocho chiapaneco, as bizcocho refers to a sweet roll – but it is mostly cut from a bigger loaf into square or rectangular pieces. Just like your favorite pound cake, it can be eaten on its own or topped with ice cream, fruit compote, fresh fruit coulis, or whipped cream. It is also ideal sliced and tucked away in your kid’s lunch box. I am just as enamored with this poundcake’s charming taste and texture as I am with the beauty of its name. And for the life of me, I cannot find out why or who named it pan de arena. Preheat oven to 350 degrees Fahrenheit. Butter the sides and bottom of a 9x13-inch baking pan and lightly coat with flour. Shake excess flour off. In a medium bowl, combine your dry ingredients: the flour with the baking powder, baking soda and salt. Beat the butter in a stand mixer with the paddle attachment over medium speed until very creamy and soft, at least 2 or 3 minutes. Incorporate the sugar, continue beating until well mixed. Add the eggs, one at a time, and continue beating until they are all incorporated. Reduce speed to low, and add a cup of your dry ingredients, then add the lime zest and juice. Continue adding the rest of the flour, and finally add the milk. Scrape the sides of the bowl with a spatula if need be, and continue beating the mix until it is spongy, fluffy and very well mixed. Pour the batter into the prepared pan and bake in the oven for 50 minutes, or until the pound cake is puffed up, golden brown on top, and a toothpick comes out clean and moist, but not wet. Remove from the oven. Let cool and serve. It keeps very well covered for up to a week. Sounds wonderful…plan to bake it! Thank you! I’M in love with your kibdness and your yummy recipes!! Aww thank you so much Angela. Pati. There is a Breton shortbread cookie called a sables (translates to sand). In the US we have Pecan sandies. The sandy texture is created by a little extra fat in the recipe. I see that this recipe has, like the classic pound cake, a pound of flour, sugar, and eggs, but goes with more than a pound of fat. So the pan de arena may be part of a tradition of “sandy” sweets made that way by the addition of a little extra fat. Words are wonderful, as are your recipes, and your show. Oh how interesting….thanks for sharing Elizabeth! ERES MI FAVORITA Chef! ☺ I’m going to make this bread for one of my cooks at work. He’s from Chiapas. He asked me when I was going to make a Pati recipe again! They know you’re my favorite too! Hope you all enjoy the bread! How important is it to make this with a stand mixer? I only have a hand held one. My mom has an old one but I am not sure if she has a paddle attachment. This sounds so yummy I want to make it! Pati, I can hardly wait to try this. I love your recipes and when I make them, my family and friends are impressed, and of course, I always say Pati showed me how. Thank you for making me a better cook! Pati, I love your show. Congratulations on your award!! Hola, Pati me gustan mucho la forma de Como mostrar la recestas de todos tus platillos de donde vienen.y no solo eso la forma de cosinar tu ases que sea muy facil ..Gracias. T,Q.M.. So happy to hear it is your new go to, Linda. Love your show, and love to hear your mastery of English. Congratulations on receiving the honors related to the James Beard award. I’m reducing my butter intake, so won’t make Pan de Arena. But I’ve enjoyed pound cake, and think your addition of lime would be a winner! Now I have another reason to respect and admire you — we are similar in that we love words. Mine started at a young age when I began to read and continues to this day. It influenced my career as a high school English/Literature teacher. Thank you for sharing who you are with us, it makes you even more endearing. Thanks, too, for your wonderful recipes. Your love of words trickles down into your ability to convey your recipes–both on your show and in written form–into clear and concise gems that make everyone who tries them feel as though they are a master. By the way, might you be returning to Fiesta Mexicana in Milwaukee, WI? Toni, Thank you for your lovely words! Wow! looks good and easy to make, I was looking at the ingredients and I have everything in my kitchen. Well make it today. Easy recipe. Hope you like it Josie! I asked about other pan sizes because my 13 X9 is sad these days. BUT, I have a 10 -15 cup Bundt pan that is screaming to have this cake in it ! I am only unsure of the baking time since this is one BIG mama of a cake . Since it’s so deep I’ll use an uncooked strand of spaghetti for a tester . Great tip from another baker ! Thanks,Pati. This is a question. Can this be baked in loaf pans ? Two or 3 ,8.5 x 4.5 or two 9.5 x 5 in. pans ? I really hope you get another award . You deserve it ! You teach Spanish ,history, geography, and you even get some cooking in there ! LOL ! Even if I can’t make or eat a lot of the things you make , you make me WANT TO ! That is a mark of a great teacher . Oh, and I love your boys ! We also have 3 boys and 2 girls . They were all so much fun but the boys gave all of us the best laughs ! Thank you for all your work esp. the work you do at home . <3 Happiest of Easters ! Hola Karen, thank you for your lovely message! You can use two loaf pans. Love how you included your children on your show. Thank you! Mi pregunta es sobre el jugo de Lime…es el limón verde ó la LIMA fruta Mexicana. GRACIAS? I would love to make this cake, but 21/2 of butter? and the sugar is too much, for a diabetic and hypertensive, why not replace half of the butter and half of the sugar? Think of the people on diets please? This recipe sounds delicious. I bet the lime zest and juice gives it just the “lift” to make it perfect. I also love the fact that the list of ingredients isn’t a mile long. Can’t wait to make this. I have a Mexican lime tree in my back yard. How much would I substitute of these little but more potent limes for the one large lime and 1/4 lime juice? I love pound cake and lime so I’m anxious to try this recipe. Thank you for being you, being vulnerable and lettIng us close to you and your family and your passions. Your love of life and tender heart has endeared me to you and I love being in your kitchen and on your travels “with you”. Hola Pati, I must say how much I appreciate your cooking…. I would try this recipe with orange instead and with an orange glaze…only because I love oranges. I love it with lime but you can always make the recipe your own ? ! It should be 2.5 cups of butter. I’m I correct, 5 sticks of butter? Hola Patricia…I will make sure to say hello to the boys! Have you developed recipes that are gluten free? There is something similar in Oaxaca de Juárez, but I think it’s made with orange. I buy it at the Quemada store where it simply is labeled as panqueque. Thanks for opening up whole new world of flavors for me and my family! I am fascinated by the new foods and combinations of tastes that you have taught me and I hope to continue learning from you. This means so much to me Karen…thank you! Consider adding nutritional analysis to your recipes. Thank you for the suggestion Patricia. thanks for this recipe, I’m going to try i it this weekend. I tried the Nana Jose’s Flour less Chocolate Pecan Cake, it’s amazing. I enjoy all your recipes. Saludos desde Tecumseh, Ontario, Canada. I made your mango pound cake recently, accompanied with fruits and wipped cream and it was just superb. Can’t wait to try this one.